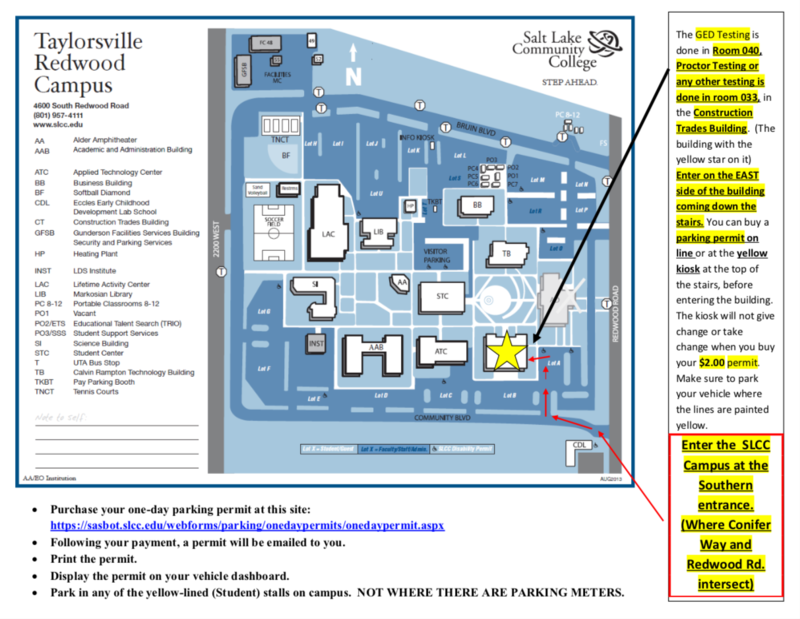 You can take the General Education Development (GED) test at SLCC’s Taylorsville Redwood campus. However, you must register for it, set an appointment and pay for the test at GED.com. Check out this Pearson Test Center Video to review procedures you may encounter. You must be 16 years old to take the GED test. The day of the test, bring a valid, government-issued photo ID: a driver's license, state ID card, passport or military ID. In Utah, if you're between 16 and 18, and your high school class has not graduated, your school district will have to give permission before you can register online to take the GED. Contact your district to fill out an Education Withdrawal and Application Form. Need more information, please contact us at 801-957-4627. The GED test is administered in Room 040 in the Construction Trades (CT) building on the Taylorsville Redwood Campus, 4600 Redwood Road, Salt Lake City, UT. You can purchase a $2 pass from the Parking Kiosk located on the east side of the Construction Trades (CT) Building. Call 801-957-4011 for more information. Visit GED.com and select Request Transcript at the top. Call 888-906-4031 for more information.